Costa Constantinides won the Democratic primary Tuesday for Queens City Council District 22. ASTORIA — Costa Constantinides won the Democratic primary Tuesday for Queens City Council District 22, beating out two other Democratic candidates and moving one step closer to the Astoria seat currently held by Peter Vallone, Jr.
Constantinides, a Democratic district leader and deputy chief of staff to City Councilman James Gennaro, defeated fellow Dems John Ciafone, an attorney, and Constantinos Gus Prentzas, a Community Board 1 member and small business owner. He took in over 55.79 percent of the votes, according to NY1. Constantinides had been leading the pack in terms of fundraising — raising more than $134,000 — and had raked in endorsements from unions and a number of Queens officials, including State Assemblywoman Aravella Simotas, who tweeted her congratulations to the candidate Tuesday night. 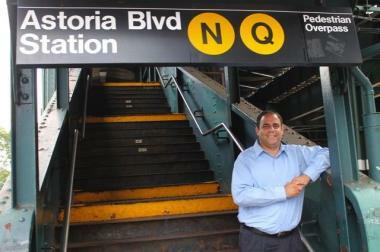 "We've got a winner @VoteCosta is #astoria's next councilman!" she tweeted. If elected, Constantinides said he wants to focus on issues like improving neighborhood schools and cleaning up Astoria's streets. He will compete in the general election in November against Green Party candidate Lynne Serpe, Republican Daniel Peterson, and Independent Danielle De Stefano. All are vying to replace longtime Astoria Councilman Peter Vallone, Jr., who is term-limited. Vallone lost his own primary bid Tuesday night, losing out to fellow Democrat Melinda Katz in the primary race for Queens Borough President.